To maximize the benefits of the Off-Axis Ion Optics, the system features three noise-reduction technologies and a detector with improved amplification performance. Due to these state-of-the-art technologies, the system can reliably detect ultra-trace femtogram-level quantities of ions. The resulting exceptional analytical sensitivity and robustness increase the value of solutions and open the door to new applications. 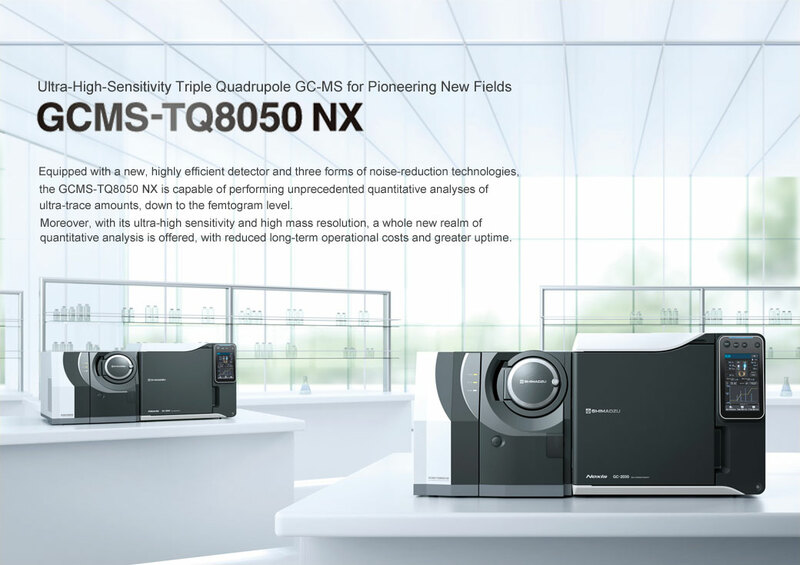 In addition to ultra-high sensitivity, the GCMS-TQ8050 NX also offers high robustness. The contamination-resistant ion source and the new detector with over five times longer service life ensure that analysis can be performed reliably for a long time. With the ultra-high-sensitivity performance of the GCMS-TQ8050 NX, injection volumes can be reduced even further than before. The service life of inserts, columns, and other consumables can also be extended to reduce maintenance frequency and costs. A new turbomolecular pump with higher evacuation performance achieves a superior vacuum state in the MS unit, which also provides high sensitivity in the single GC-MS mode. With the high-efficiency collision cell (UFsweeper) installed as before, high-sensitivity detection is possible even when mass resolution is increased. The new active-time management function achieves further operating efficiencies by appropriately managing the wait times that occur during maintenance, while switching systems, or when the system is used by multiple users, to extend the operating time. The Smart Database™ series, which are specialized for various fields, and Smart MRM™ function, which optimizes sensitivity, can be used to accurately create methods for ultra-trace analysis and reliably achieve high-sensitivity analysis from MRM measurements. LabSolutions Insight™ software, designed to support quantitative analysis of multianalyte data, enhances the throughput of data analysis from simultaneous analysis of multiple components in trace concentrations. The extensive accuracy control functions enable decisions to be made based on the easy-to-understand visualization of quantitative analysis and accuracy control results.